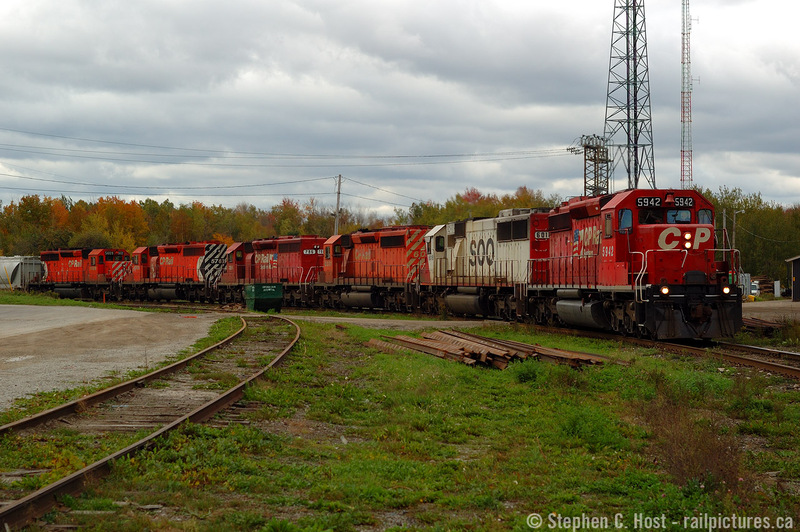 Railpictures.ca - Stephen C. Host Photo: Phil Hall recently commented: “these days power is assigned by HPT. In the good old days it was all about the ruling grade” – I think this is an example of a ruling grade train no? Instead of taking the Oakville sub this train had enough power to tackle Waterdown Hill so up it went.. The fact this came as a suprise really goes to show how much has changed in our fanning world in 12 years. It’s hard to believe, but we didn’t always know what was running and back on this day, I was at Hamilton West with some friends and this Northbound went by after Barnes Turn returned form working the Compass Minerals plant. We knew a SD40-2 was leading, that was just normal – the scanner being our source of information. Once we saw six locomotives.. I had to chase it. I didn’t know the roads well so I didn’t chase for multiple shots, instead I just went straight to the jct and got this photo, and I’m glad I did. The funny thing I was thinking about this – Since 2001 I have carried a Blackberry and by 2005 I was well connected to various chat groups (one of which I started with a friend – you are welcome to join us if you want – #railfan on IRC Chat – since 2003! ) but for the most part, before Facebook, before Twitter, not too many people carried the Internet while ‘fanning and I was mostly communicating with people on desktop computers at home. Phone calls still dominated any sighting reports and naturally to very small groups. It didn’t take long for people to get Blackberries in the next year or two, and the FPON (Join us if you want sightings for Ontario!) group was started to take advantage of technology and it’s only taken off since then to other arenas such as Facebook and what not. I’m amazed how simple it was 12 years ago compared to today. If anyone has noted to what train symbol this was it’s appreciated. Thank you. | Railpictures.ca – Canadian Railway Photography – photographie ferroviaire Canadienne. Phil Hall recently commented: "these days power is assigned by HPT. In the good old days it was all about the ruling grade" - I think this is an example of a ruling grade train no? Instead of taking the Oakville sub this train had enough power to tackle Waterdown Hill so up it went.. The fact this came as a suprise really goes to show how much has changed in our fanning world in 12 years. It's hard to believe, but we didn't always know what was running and back on this day, I was at Hamilton West with some friends and this Northbound went by after Barnes Turn returned form working the Compass Minerals plant. We knew a SD40-2 was leading, that was just normal - the scanner being our source of information. Once we saw six locomotives.. I had to chase it. I didn't know the roads well so I didn't chase for multiple shots, instead I just went straight to the jct and got this photo, and I'm glad I did. The funny thing I was thinking about this - Since 2001 I have carried a Blackberry and by 2005 I was well connected to various chat groups (one of which I started with a friend - you are welcome to join us if you want - #railfan on IRC Chat - since 2003! ) but for the most part, before Facebook, before Twitter, not too many people carried the Internet while 'fanning and I was mostly communicating with people on desktop computers at home. Phone calls still dominated any sighting reports and naturally to very small groups. It didn't take long for people to get Blackberries in the next year or two, and the FPON (Join us if you want sightings for Ontario!) group was started to take advantage of technology and it's only taken off since then to other arenas such as Facebook and what not. I'm amazed how simple it was 12 years ago compared to today. If anyone has noted to what train symbol this was it's appreciated. Thank you. That’s right Stephen, it was easier to set off the intermodal traffic at Obico using the Canpa Sub, sane for CP 166 making lifts there. I believe 166/167 wild lift and set off at Obico every other day, but it’s been a long time! Makes sense, work at Obico?? @Stephen C. Host usually if 167 had intermodal on it would run the Oakville. I agree RLK but usually there’d be some head end doublestacks.. i don’t see any in any of my shots So I’m confused! Very nice! I’m glad I was able to shoot a lot of what often appeared to be overpowered northbounds. Miss the sound of all those EMDs in one consist. Great shot Stephen. Keep in mind not all those units would’ve been online! Anyway, that train was likely CP 167. Nice shot of our “good old days”. Hey, I favourited this one a few days ago. Glad it came back.